There are two things our customers tell us when we speak with them after they’ve had time to live in and enjoy their new outdoor room. First they tell us they wish they had done it sooner. Secondly, they tell us it’s their favorite room in the house. This has been true throughout the time we’ve been designing and building outdoor living spaces here in the Kansas City market. Now there is a new trend we’re seeing. Homeowners are now considering adding multi-function outdoor living spaces. Multi-function spaces include those that are either large enough to include separate living spaces or spaces that actually include multiple outdoor structures. 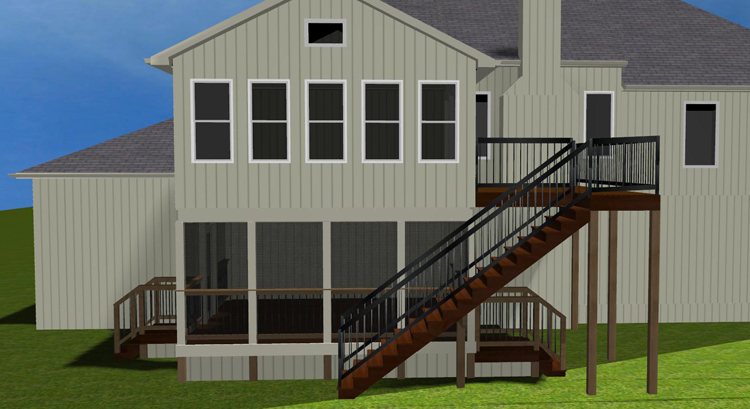 For example, a large deck or screened porch may accommodate both an eating area and enough room for a seating area. 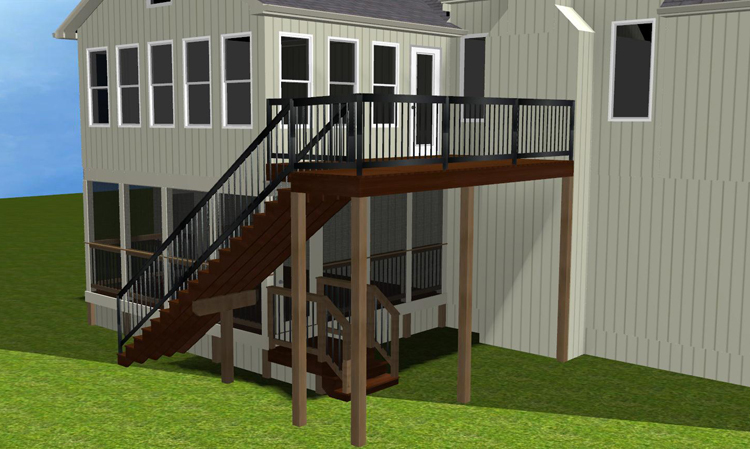 A space including multiple outdoor living structures may add multiple living spaces to your home as is the case with a project we are just beginning in Shawnee, KS. These homeowners wanted a sunroom, a screened porch and a deck. Their yard has a drop-off so they are able to add outdoor living spaces at both levels. On the lower level walkout, we are building a screened porch. The basement door leads to the screened porch. Atop the screen porch will be a new sunroom. There is a walkout from the kitchen and dining area to the new sunroom. Then, one of the side walls of the sun room will lead to a new second-story deck. The deck has stairs leading down to the ground. For the decks, steps and screened porch floor, the owners chose to use Ipe which is a strong Brazilian hardwood. They wanted a natural product that was extremely durable and long lasting. The sunroom will have hardwood floors. The upper level sunroom is actually called a 12-month sunroom. It will have insulation and energy efficient windows so it can be used 12 months of the year. It will also have heat and A/C. The room does have a separate unit because the sun in the sunroom might be dramatically different than in the rest of the house. With separate thermostatic control and a separate unit, they can turn it off when they go out of town. 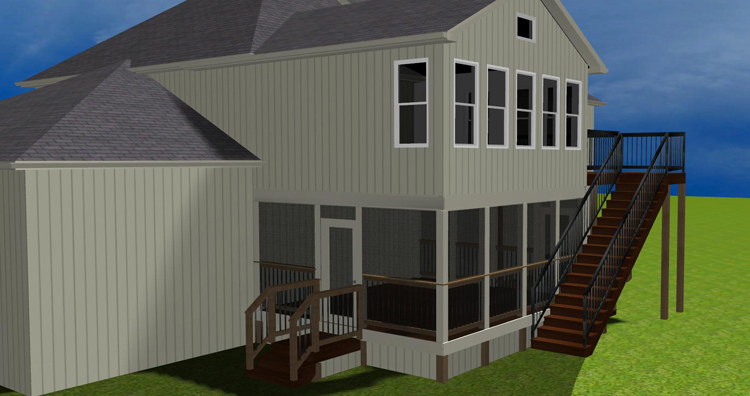 Here’s a design rendering of the project to give you a glimpse of what the finished project will look like. When complete in November, we will follow up with pictures showing all the details and finish choices. This entry was posted in Four-season rooms, Room additions, Screen Porches, Sunrooms and tagged 4-season porch Kansas City, Archadeck KC, Archadeck of Kansas City, Kansas City porch builder, Kansas City screened porches, Sunrooms Kansas City on October 29, 2012 by archadeckkansascity.